The ICC has withdrawn the proposal for a two-tier structure in Test cricket at the meeting of its chief executives' committee (CEC) in Dubai on Wednesday, despite six Full Members reportedly being in favour of it. There was no vote at the meeting but the consensus was to take the proposal "off the table" for the moment. "There was a significant compromise and it was subsequently decided to withdraw the two-tier proposal," a chief executive who attended the meeting told ESPNcricinfo. He said the BCCI, Sri Lanka Cricket, the BCB and Zimbabwe Cricket had opposed the proposal, which had found support from the boards of Australia, England, South Africa, New Zealand, Pakistan and West Indies. On Monday, the players' global body FICA had revealed that 72% of players quizzed for the body's annual survey were in favour of "the introduction of a divisional Test competition to add more meaning to each match". The FICA executive chairman Tony Irish had urged the ICC Board to carefully consider the new model.. According to the proposal, the two-tier system would comprise seven teams in the top tier and five in the bottom, with promotion and relegation between the two based on performance. To begin, Afghanistan and Ireland, as the leading Associate teams, would join the three lowest-ranked Test playing nations in the bottom tier, with other Associates having a chance at promotion based on performance. The two-day CEC meeting was not part of the quarterly meetings held each year by the ICC but a special meeting where Member Board representatives convened to discuss international cricket structures in all three formats. The chief executives discussed alternative models to invigorate the health of Test and ODI cricket, and provide more context to fixtures, while taking into account the danger of excessive Twenty20 cricket. One proposal was to bring back the World Test Championship, but many board representatives including strong members like BCCI were not in favour of it. "They wanted a Test Championship. That cannot happen because there is not time enough for everybody to play everyone [in the current Future Tours Programme cycle]," a chief executive said. Another proposal was for the top-two teams in the ICC rankings to have a play-off for the Test Championship. It was decided that the chief executives would discuss that plan with their own boards before deliberating further. The ICC statement following the meeting on Wednesday was vague. The ICC chief executive David Richardson said "significant progress" had been made at the two-day workshop where chief executives had discussed how to improve the quality of bilateral cricket. 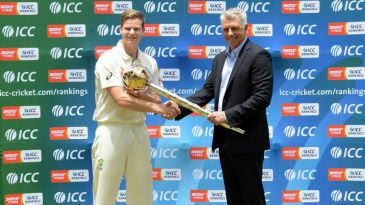 "Encouragingly there is an appetite from the ten Full Members for more context around all three formats of the game and we have consensus on a range of areas," Richardson said. "This includes the details of ODI and T20 structures and principles around Test cricket schedules, which include the concept of a Test Champion play-off every two years, and the opportunity for more nations to be involved." Without saying the two-tier proposal was off the table, Richardson said any new model would be put in place only from 2019, when broadcast deals are renewed by the Full Members. "There are some complexities, not least because of scheduling and existing structures, but we envisage the changes being implemented for 2019. "Members will now revert to their boards to share the details of the proposed revised structures and principles. Work will continue to develop a clear structure and position for each format over the coming months as the ICC collectively focuses on improving bilateral cricket for fans and players in the long run."